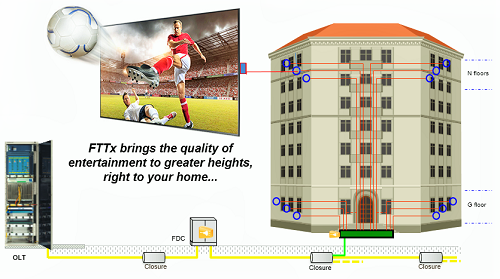 Fiber to the Home (FTTH), Fiber to the Building (FTTB), Fiber to the Premises (FTTP) and Fiber to the Curb (FTTC), termed as FTTx are various technology and deployment options developed to enable reach of fiber as close to the user location as possible to provide high speed data and voice services. Yet the challenge remains in creating a low capex network for the operator which has minimal initial utilization and returns. Therefore, cost optimization, network scalability, long term reliability and traceability of the network elements becomes important. With FTTx becoming a necessity in the current environment to cater to ever increasing bandwidth requirements of the customers, HFCL offers a comprehensive FTTx solution to Telecom Operators, ISPs, Real-estate businesses, Public and Private sector enterprises (Educational, Hospitality and other commercial establishments) that seek to deploy Fiber access for their customers/users. FTTx Network is designed with state-of-the-art GIS tools, based on Landbase data that contains buildings, roads, streets, parks, playgrounds etc. FSA is planned in such a way that it covers the maximum Homes/Customers to meet the KPI and design from OLT to first stage splitter, covering 1000 ~ 4000 subscribers. 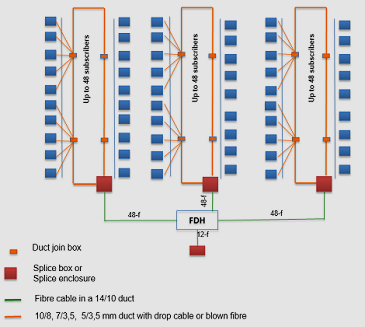 Fiber route planned between Stage-1 Splitter to Stage-2 Splitter is called as distribution route. 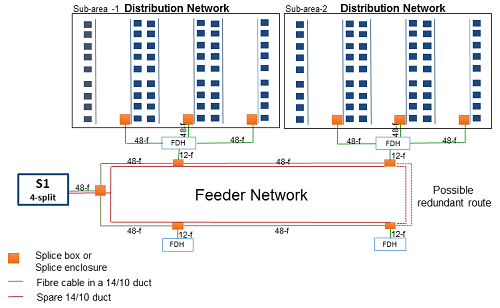 Distribution sections connect neighboring buildings from S1 splitter location in its designated cluster. 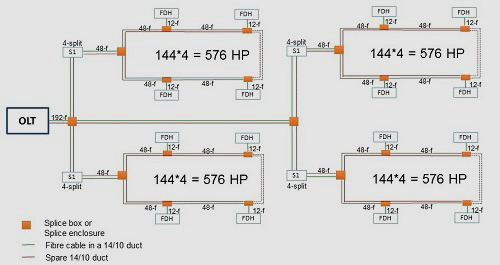 Design from 1st stage splitter to 2nd stage splitter, covering 50 ~ 200 subscribers. Planning the CSA/S2 splitter cluster requires BI, Open plots, under construction buildings information and the Landbase data, which contains building, roads, streets, parks, playground etc. Design from 2nd stage splitter onwards covers 10 ~ 40 subscribers. Design is customized based on prevalence of types of buildings – Multi Dwelling Units (MDUs), Single Dwelling Units & Villas (SDUs), Offices & Commercial Buildings.